Last year, when I was visiting near the Sacred Valley with my daughter Rebecca, we were able to visit the Salineras near Maras. I was fascinated with this ancient site where salt has been harvested for over 500 years and maybe even for a millennia. 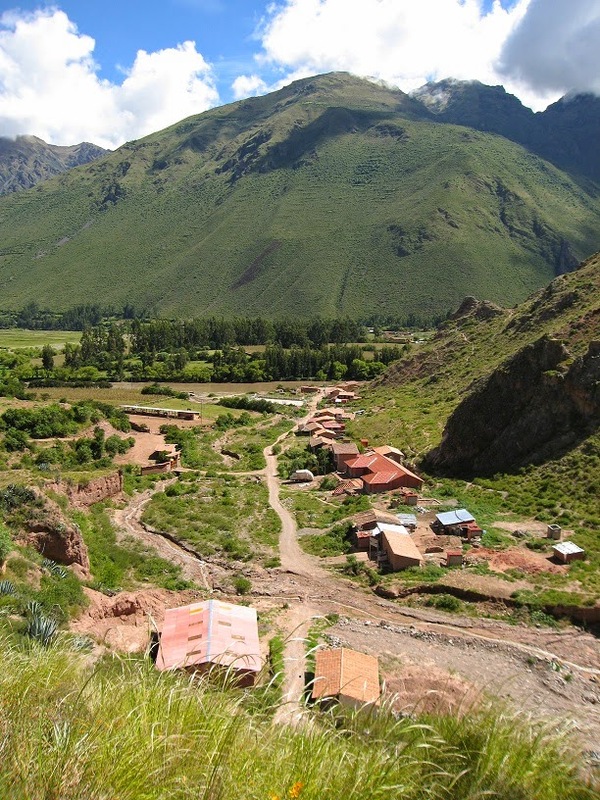 So, on Thursday I decided to again hike up to the salt farms—a beautiful and tough climb from the Sacred Valley. 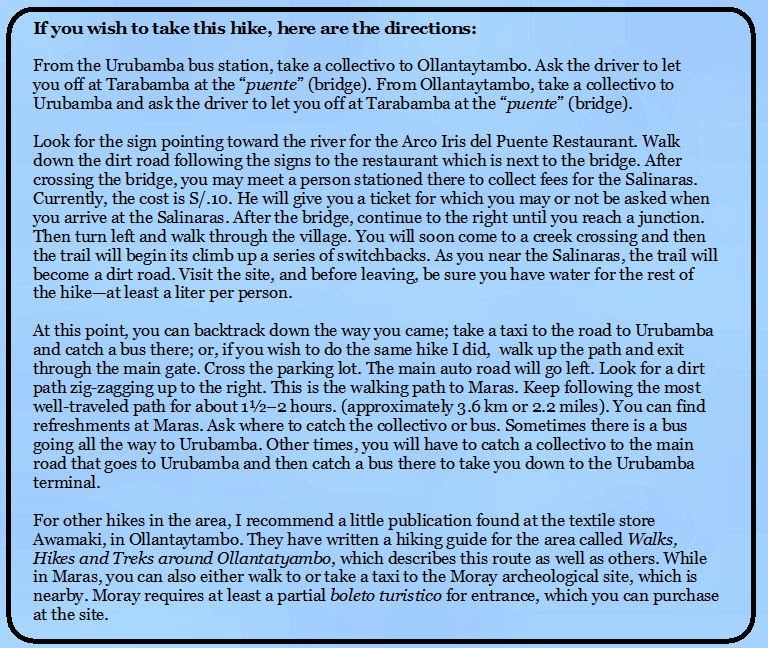 I took a collectivo (combi or van) from Calca and asked to be let off at Tarabamba, a little village east of Urubamba. 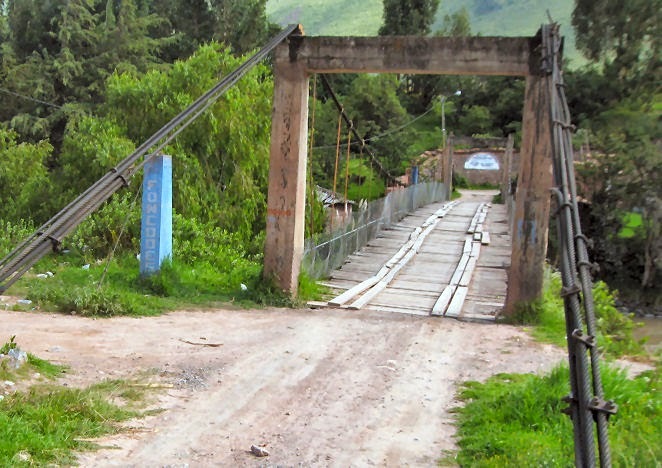 Following a road which led me over the abundantly-flowing Urubamba river, I soon found myself walking UP the trail. It is a steep, rocky trail and my trekking poles came in very handy. After about 45 minutes of climbing, occasionally using the excuse to look back down the valley in order to catch my breath, I came upon the site of the Salineras—a grand operation! In another 20 minutes, I was walking along the pathways among the ponds. 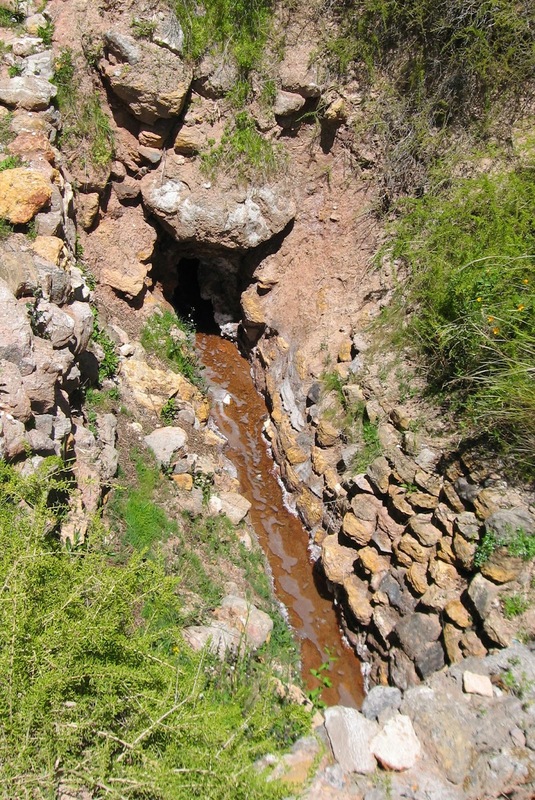 This salt spring is the origin for all the water used in the Salineras. 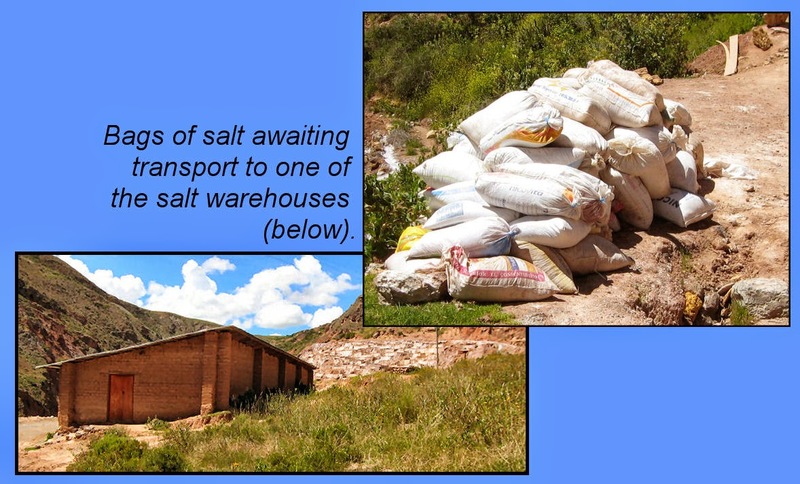 The salt, in various forms, is sold wholesale to companies who bring their trucks up to collect large bags from the on-site warehouses. We are now in early autumn, and it still rains frequently enough that the farms are not in full operation, but some people were here digging out their ponds, flattening the bottoms, and preparing them for the beginning of salt season (roughly May through November—the dry season). 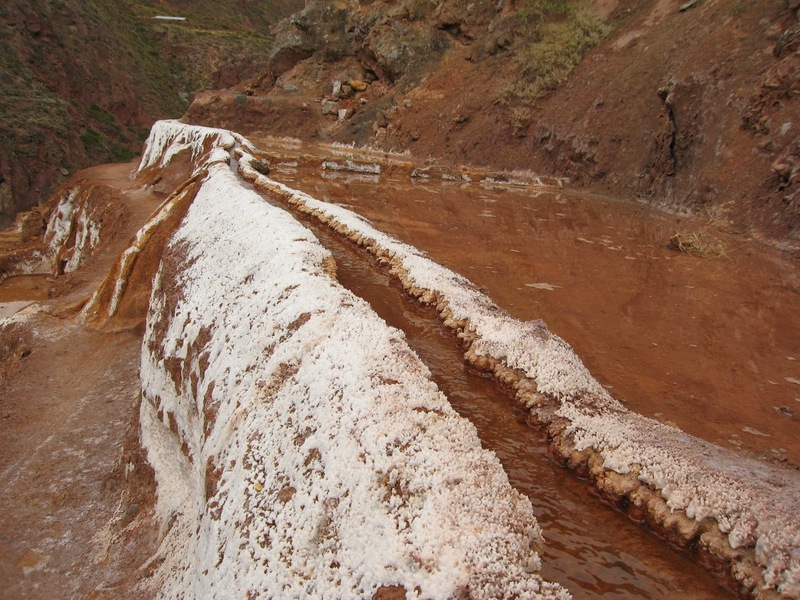 The ponds and sides of the water channels are encrusted with salt, giving an other-worldly feeling to the entire site. The evaporation process takes about a month, then the salt is harvested and the pond is refilled with saltwater. When harvested, the salt is graded into three categories, white (sal extra) which comes from the top of the evaporated layers; pink (rosa or sal primera) which comes from the middle; and mineral or medicinal (sal tercera) which is harvested from the bottom layer. The first two are culinary grades and the last is only used for medicinal purposes like baths. 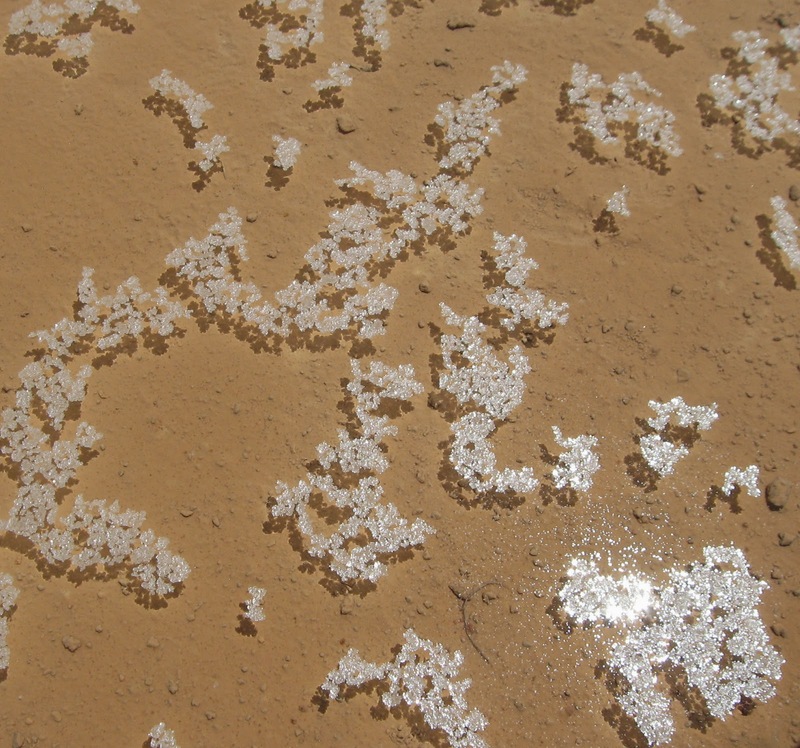 Salt crystals floating in one of the ponds. After leaving the Salineras, I walked up another series of switchbacks and on for almost two more hours uphill to the little village of Maras. The view of the Andes mountains is very dramatic from there, especially with the dark rain clouds hanging over them. I walked exhausted into Maras and stopped at the first street vendor in the plaza to buy some Powerade (yes Powerade!) which helped replace some of my electrolytes. The young man even had some cold bottles and, even though I usually hate the stuff (too sweet! ), I guzzled it with relish and felt much better. The plaza in Maras–a welcome sight! I hopped on the first collectivo out of town and within half an hour, I was in Urubamba and soon to be back in Calca where a warm shower awaited me.